Painful bunions interfere with walking and exercising, but you can keep them from getting worse. Many women have a bunion — a deformity of the metatarsophalangeal (MTP) joint at the base of the big toe. A bunion develops when the first metatarsal bone of the foot turns outward and the big toe points inward (toward the other toes), causing the joint to jut out (see "Anatomy of a bunion"). The Latin name for the deformity is hallux valgus (hallux means big toe, and valgus means turned away from the midline of the body). Most shoes don't accommodate the resulting protrusion and so put pressure on the misaligned joint. Eventually, the bursa (a fluid-filled sac that surrounds and cushions the joint) becomes inflamed, and the entire joint becomes stiff and painful. A bunion is most likely to develop when susceptible feet are repeatedly squeezed into narrow, pointed-toe footwear. The big toe pushes against the other toes, sometimes diving over or under them. As a result, the base of the big toe — the metatarsophalangeal (MTP) joint — juts or angles out from the foot. 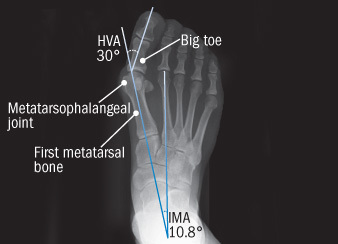 To judge how severe a bunion is, clinicians take an x-ray and measure angles between certain bones in the foot, in particular, the hallux valgus angle (HVA) — the angle between the first metatarsal and the big toe — and the angle formed by the first and second metatarsals, called the intermetatarsal angle (IMA). The upper limit of normal for the HVA is 15 degrees; for the IMA, 9 degrees. Shoes with narrow toes can trigger a bunion, but they're not the underlying cause. Bunions run in families, because foot type (shape and structure) is hereditary, and some types are more prone to bunions than others. Low arches, flat feet, and loose joints and tendons all increase the risk. The shape of the metatarsal head (the top of the first metatarsal bone) also makes a difference: if it's too round, the joint is less stable and more likely to deform when squeezed into shoes with narrow toes. High heels can exacerbate the problem because they tip the body's weight forward, forcing the toes into the front of the shoe. This may help to explain why bunions are 10 times more common in women than in men. People in occupations such as teaching and nursing, which involve a lot of standing and walking, are susceptible to bunions. So are ballet dancers, whose feet suffer severe repetitive stress. Women can develop bunions and other foot problems during pregnancy because hormonal changes loosen the ligaments and flatten the feet. Bunions are also associated with arthritis, which damages the cartilage within the joint. You may be able to relieve pain and prevent bunions from progressing with conservative measures that take pressure off the MTP joint and improve foot mechanics. Bunions generally don't require surgery unless there's an underlying deformity that can't otherwise be corrected or the pain becomes debilitating despite conservative treatment. The MTP joint helps us bear and distribute weight during a range of activities. A bunion at this critical junction of bones, tendons, and ligaments can seriously impair the foot's functioning. For one thing, a bunion on the big toe can damage the other toes. Under the pressure of the big toe, they may develop corns or become bent, forming hammertoes. The nails may become ingrown, and calluses may form on the bottom of the foot. If you constantly shift your weight off the painful big toe joint to other metatarsals, you may develop discomfort in the ball of the foot. As the misshapen joint becomes more uncomfortable and harder to fit into shoes, you may have to curtail exercise and other activities. Even walking may become difficult. Especially in older women, foot disorders are a major cause of disability and sedentary habits. Older women are more likely to have bunions as they get older, and the more severe their bunions are, the lower their quality of life is. You should seek treatment if the pain and deformity interfere with daily routines and physical activity. The first step is to relieve the pressure by wearing the right kind of shoe. (It's also important to maintain a normal weight.) Shoes should have a wide, flexible sole to support the foot and enough room in the toe box (the part surrounding the front of the foot) to accommodate the bunion. Some good choices are sandals, athletic shoes, and shoes made from soft leather. Shoes with a back should have a sturdy heel counter (the part surrounding the heel) to keep the heel of the foot snugly in place. You may be able to reshape narrow shoes with stretchers that make room in the toe box for the bunion. Keep heels low (no higher than an inch). You can also protect the bunion with a moleskin or gel-filled pad, available at drugstores. (Make sure your shoes have enough space to accommodate it.) A clinician may recommend semisoft orthoses (shoe inserts) to help position the foot correctly as it strikes the ground. You can also wear a splint at night to hold the toe straight and ease discomfort. When the bunion is irritated and painful, warm soaks, ice packs, and nonsteroidal anti-inflammatory drugs such as aspirin or ibuprofen may help. Whirlpool, ultrasound, and massage may also provide some relief. Cortisone injections can relieve pain temporarily by reducing inflammation, but they have many side effects, especially when used often and at high doses. If conservative measures fail and you still have pain that interferes with daily activities, you may need surgery to restore the toe to its normal position. Never undertake bunion surgery merely for cosmetic purposes, and never rush into it. You won't necessarily get rid of all your symptoms, and you'll have to stay off your foot for many weeks. Complete recovery can take a year or more, depending on the procedure. As with any surgery, you'll want to make sure the surgeon is experienced in performing the particular operation you've decided to undergo. You may also want to talk to other patients who've had the operation. The aim of surgery is to relieve pain and restore normal function by eliminating the bony protuberance and realigning the joint (including ligaments, tendons, and nerves). There are more than 100 surgical procedures for bunion correction, but few of them have been evaluated or compared in controlled trials. The surgeon will take x-rays and make measurements that help classify the bunion as mild, moderate, or severe. She or he will also take into consideration your age, activity level, and health and the strength of your bones and connective tissue. The more severe the bunion, the more complicated and risky the surgery. For mild deformities, the surgeon will probably choose bunionectomy — shaving off the enlarged portion of the bone and realigning the muscles, tendons, and ligaments (see "Bunion surgery by category"). For moderate deformities, it may be necessary to cut the bone close to the metatarsal head in order to shift it back into its proper position. To correct severe bunions, the surgeon makes a cut at the base of the metatarsal bone, rotates the bone, and fixes it in place with pins or screws. Cutting and repositioning the bones is called an osteotomy. Bunionectomy and osteotomy may be performed under local, general, or spinal anesthesia on an outpatient basis in a hospital, surgical center, or doctor's office, usually by an orthopedic, podiatric, or other specialist foot surgeon. Some of these surgeries can be performed using minimally invasive techniques. None of them will reshape your foot to fit into the kind of narrow shoes that may have created the problem in the first place. Shaves the bony excess on the outside of the metatarsal head. Realigns the muscles, tendons, and ligaments surrounding the joint. Recovery takes 3–4 weeks and usually involves wearing a postoperative shoe. May not correct the deformity that caused the bunion. Same as for a mild bunion, plus osteotomy (cutting) of the metatarsal head to shift it into proper alignment. The bone is held in place with screws or pins. Recovery takes 4–6 weeks, depending on the procedure. You may need to wear a short cast and use crutches. Cuts away the bony excess at the head of the metatarsal bone. Removes a wedge-like piece of bone and realigns the metatarsal, which is secured with screws or pins. Corrects tendons and ligaments. Recovery takes 6–12 weeks. You may need to wear a short cast and use crutches. If the joint is beyond repair, it may be replaced with an artificial joint. Variations among toe-joint deformities and surgical techniques make it difficult to evaluate the results of bunion surgery. Some studies suggest that 85% to 90% of patients are satisfied with their results, but one review found that about a third of patients were dissatisfied even when their pain and toe alignment improved. The problem may be unrealistic expectations. Some patients mistakenly believe that after surgery, the big toe will be completely straight and the foot will fit into narrower shoes. ("We can't make the foot or bunion area perfect; we can make it better," says Dr. James P. Ioli, chief of podiatry at Brigham and Women's Hospital in Boston.) Patients may also expect faster relief from pain and swelling than the procedure allows. Complication rates from various studies range from 10% to 55%. The most common complication is recurrence of the bunion, reported in as many as 16% of cases. This can happen when only the bony prominence is shaved off and the underlying deformity is not corrected. Sometimes the cut bone reunites too slowly or, rarely, doesn't come together at all. This condition, called nonunion, usually requires another surgery. Other possible complications are irritation from the pins or screws used to hold the bone together and excessive scarring or stiffness. Swelling after surgery usually eases within two months but may last six months or longer. The joint may be stiff for several months. Nerve damage and continued pain are rare, but when they occur, they can lengthen recovery time and create a need for further surgery. The chance of infection is less than 1%. The decision to undergo surgery isn't easy. You'll need to weigh the potential benefits against the risks. The good news is that bunion surgery isn't a medical crisis. You have time to investigate, weigh your options, and, if you wish, secure a second opinion. Dr. James P. Ioli, chief of podiatry at Boston's Brigham and Women's Hospital and assistant professor of orthopaedic surgery at Harvard Medical School, helped prepare this article. Ask the doctor: What's the best way to treat toenail fungus?